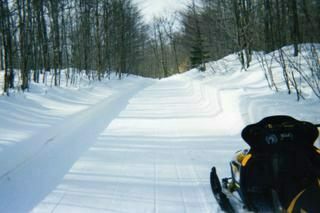 South trails were all groomed Sunday Morning per groomer Jason J, With a Good to Great rating. If your reading this and ride our trails, we need your help,we are in need of members. We are one of Michigans oldest clubs, forming in 1969, over the years membership has gone up and down, right now we have less than thirty members on the rolls and probably only twelve actually do all the work. Even if you can`t help all the time with brushing in the fall or grooming thru the winter, some help, when ever available would be more than welcome. If you can`t help physically your membership dues helps us do the things the DNR doesn`t help with. Again, if you like smooth trails, we need you, the trails don`t groom themselves.